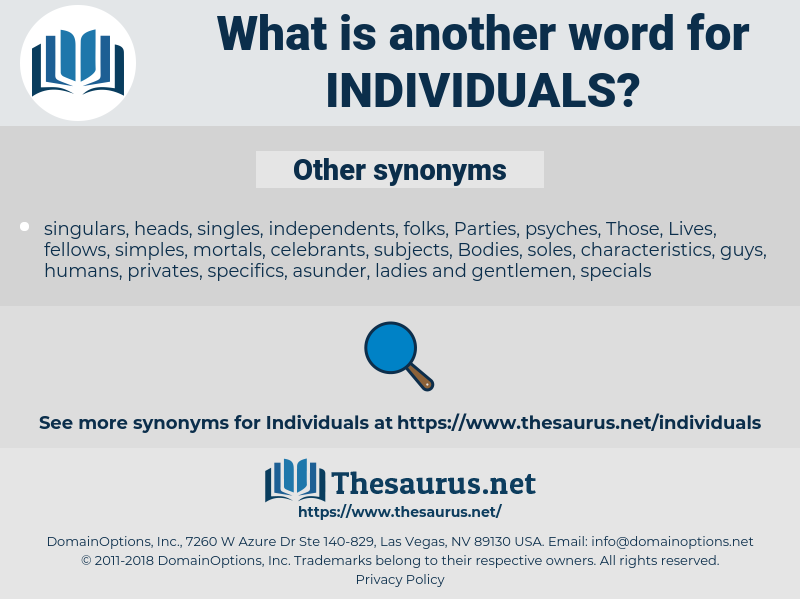 What is another word for individuals? 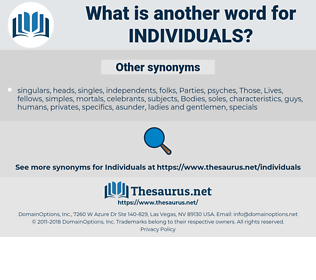 Canadians, beings, candidates, Koreans, IDPS, minors, chairs, MINES, passengers, Persons. al, finland, U.S., disposal, Zealanders, older, community, conditionally, user, users, mentally, stakeholders, Entities, anglers, panellists, Organizations, elements, participation, Vern, prisoners, system, senior, subjects, food, passengers, library, uses, Faces, protection, contributors, attendance, seminar, trust, cadre, t5013, Pers, Les, HQP, hiv, workshop, person, Persons, deaf. particulars, circumstances, Animals, each, internally, NATIONALS, provincial, Indians, L, individuelles, certain, Soldiers, independents, professionals, minds, Investigators, Personalities, Interviewers, investigations, end-users, Families, clinicians, Households, Patients, interlocutors, interviewees, juveniles, learners, civilians, aliens, Guards, matters, intervenors, instances, Canadians, Adults, inmates, representatives, i.e., villagers, criminals, purpose, purposes, assailants, defendants, investors, details, officials, interveners, violations, claimants, belonging, dwellings, inputs, Everybody, Students, grand, designated, decision-makers, Clients, Detained, complainants, MENS, illustrations, internees, headlines, Bandits, physically, audiences, litigants, plaintiffs, approximately, only, factors, Referrals, declines, Industries, Relatives, readers, Communities, Nationalities, customers, Recommendations, inhabitants, organisms, violators, variables, arrivals, appellants, holders, Children, informants, souls, practitioners, lenders, bystanders, indictees, asylum-seekers, goal, dependants, Snails, Incomes, Rights, singles, drivers, journalists, demonstrators, institutions, events, Males, Consultations, Consultants, concerned, travailleurs, particuliers, times, leaders, mandate-holders, Duties, Injuries, diagnosed, job-seekers, Plants, seals, travelers, Administrators, cooperatives, establishments, Specialists, interns, entrepreneurs, travellers, Females, human-beings, Beneficiaries, Austrians, victims, Kidnappings, cards, jobseekers, protagonists, suppliers, servants, tenants, Populations, behaviours, Disabilities, perpetrators, proceedings, panelists, volunteers, recipients, Caregivers, D, Occupations, jobs, corporations, complaints, units, Parents, kids, subscribers, others, callers, abductions, saves, borrowers, labourers, levels, Interviews, Killings, interested, fields, Inquiries, operatives, Larvae, lizards, contractors, beings, nations, example, examples, workers, agents, Measures, taxpayers, owners, Dignitaries, Gentlemen, taxfilers, awardees, peoples, trainees, transferees, Whoever, things, trainers, interests, candidates, Fishermen, enterprises, Donors, direct, intakes, conditions, changes, nobody, delegates, destruction, limbs, parts, Friends, artisans, Classes, mourners, hands, Standards, Expenditures, admissions, staffs, tenders, Companies, years, assertions, pilots, fellows, samples, dossiers, applications, sufferers, earnings, Europeans, registrants, MINERS, accused, evacuees, facilitators, claims, residents, data, tokelauans, managers, offenders, Spouses, Ladies, licensees, issues, Provided, requesters, Pupils, Businesses, personages, conspecifics, Wounds, Los, suspects, foreigners, objectives, constituents, reviewers, Survivors, spokespersons, consumers, allows, Carriers, takers, demands, prosecutions, technicians, creatures, partnerships, files, dependents, detentions, targets, adherents, Physicians, enables, authorizes, occupants, descendants, homeowners, IDPS, abductees, Researchers, assets, credits, benefits, organisations, perspectives, Penalties, list, lists, consent, reservists, compatible, points, skills, executions, Solos, components, maples, guys, fans, dwellers, collaborators, incumbents, items, viewers, Categories, accidents, scientists, Agencies, Resources, seniors, addicts, providers, specimens, VIPS, services, colleagues, young, aids, names, fugitives, partners, collections, appointees, preparers, Couples, shortcomings, questions, media, Casualties, topics, densities, warheads, steps, payments, transmission, heirs, terrorists, girls, settlers, Workmen, seekers, clientele, improvements, responders, Fatalities, Ones, folks, ramets, Craftsmen, Nurses, gatherers, unemployed, helpers, government, culprits, Voles, outcomes, belongs, Talents, Operators, gens, artists, firefighters, advocates, Stations, witnesses, Firms, protesters, words, Freedoms, Records, Celebrities, Habitats, teachers, spectators, Capita, visitors, amounts, expressions, ranks, cases, aggressors, frontiers, earners, Boundaries, employers, petitioners, commentators, minors, speakers, observers, consequences, peers, Wolves, losses, electors, makers, youth, Youths, Whales, Infections, lookouts, references, nominees, quarters, Tests, situations, immigrants, elders, Programs, caretakers, signatures, fishers, supported, boys, contacts, vessels, Fishes, Surveys, extremes, returnees, pensioners, Having, guests, commissioners, Bodies, performers, access, fighters, Areas, harvesters, Taxes, Voices, Lives, politicians, carers, doctors, weapons, police, troops, reserves, groups, projects, aged, hits, terms, barriers, segments, circles, authors, accepts, Migrants, heads, scholars, millions, Copies, patrons, concerns, Facilities, turtles, add, Charges, Risks, activists, rescuers, producers, recruits, Bears, retirees, voters, arms, models, competencies, proprietor, practices, graduates, convicts, deaths, Which, Minorities, unsubs, specificities, presenters, states, herons, newcomers, aspects, arrests, Trees, contributions, unemployment, Characters, expenses, Permits, Owls, Refugees, Eels, officers, sujets, chances, sectors, frogs, responses, numbers, processes, supporters, critics, Deficiencies, sanctions, mps, Appointments, careers, smokers, Remedies, themes, Mice, snakes, Hires, returns, experts, homes, places, Newts, kills, actors, obstacles, Houses, sponsors, sources, calls, chiefs, MEPS, hazards, Elles, dead, have, months, programmers, referees, Boxes, courts, deportees, counterparts, citoyens, needs, types, bats, associates, offences, comments, ec, Crimes, accounts, forces, causes, PMCS, gaps, birds, Maps, Deputies, requests, Fisheries, writers, is, opinions, rows, VOTES, borders, directors, Roles, ages, membres, Stories, #, Parties, posts, e, act, Policies, 59, 2005, figure, figures, positions, LINEs, _, users, stakeholders, Entities, anglers, panellists, Organizations, elements, prisoners, subjects, passengers, Faces, contributors, Pers, person, Persons. includes, exists, restricts, heads, kills. And if you abstract yourself from individuals and look at that thing, the ear, in the wide field of life, what a great, living reality it is! It was considered good taste to inquire the opinions of individuals by turns.